Wie hat dir "HârnWorld" gefallen? 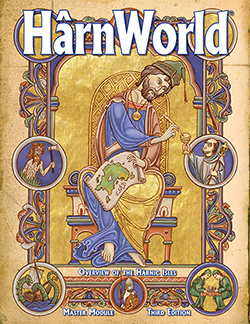 Hier könnt ihr eure Meinung zu HârnWorld abgeben und nach Punkten bewerten. Hârn Overview: This 58-page Hârn article is a general overview of Hârnic cultures, governments, economics, history, and more. It also includes campaign aids for such tasks as generating weather conditions and character backgrounds. Hârn Regional Map: The 22 x 34 inch full color map of Hârn provides a vast amount of information with a unique cartographic system developed specifically for fantasy gaming. The area detailed measures 620 by 930 miles (1000 by 1500 km). The colors and textures show vegetation and terrain as noted on the map key.